Once again we see an announcement in the news being filtered through an ‘evolutionary sieve’, such that it ends up with quite a different spin on what was actually found. 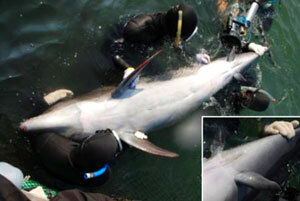 Despite much of the media hype, pictures of the dolphin like this one show a streamlined, symmetrical pair of fins. Click to view larger. To the land and back again? Dolphins, as air-breathing mammals, are supposed to have descended from land-dwelling mammals which had legs for walking and running on land. The story goes like this: fish evolved into amphibians which left the sea to go onto the land, later evolving into reptiles, then mammals. Subsequently, some of those reptiles evolved right back into the sea again (as turtles and marine reptiles like ichthyosaurs). Some of the mammals did likewise, becoming today’s whales and dolphins (not to mention seals, walruses, manatees, dugongs, etc.) So the evolutionist must believe that the dolphin’s ancestors lost their running hind limbs. Despite occasional fanfare, such as the Pakicetus embarrassment, the fossil record gives no convincing support to this proposition. And the specific proposed ancestor has also changed from mesonychids to artiodactyls, meaning that the supposedly watertight proof of mesonychid ancestry had to be explained away. That is, supposedly homologous features of mesonychids and whales, attributed to common ancestry despite the problems with this, had to later be explained away as homoplastic/convergent, i.e. having nothing to do with common ancestry. Whereas most dolphins have only two front fins, we now know that some dolphins have two front and two rear (the dorsal fin is not being considered in this discussion). 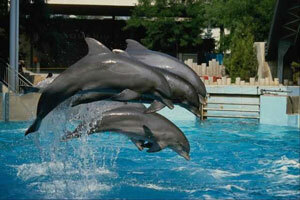 In other words, the genetic information for these extra fins is a part of the total gene pool of the dolphin group. Today’s two-finned dolphins may actually have the latent genetic information for generating all four fins. All dolphins may have once had two rear fins, and subsequently lost the information for generating them. Since the fins are not used for propulsion but for steering, it may be that one pair is adequate, so natural selection would not work against a mutation that corrupted the information to develop the rear pair. This sort of downhill change has nothing to do with turning something like a cow or a wolf into something like a whale. The average citizen is bombarded almost every week with such evolutionary ‘proofs by press release’, and the cumulative indoctrinatory effects, like a continual ‘drip feed’, are profound, overwhelming the normal processes of reason with a powerful ‘impression’. No wonder not many people fail to be affected in some way, so that the Bible’s real history becomes progressively more ‘unreal’. But the effect is psychological, not logical. The raw facts of the world have always been utterly consistent with Genesis creation. See, e.g. http://www.breitbart.com/news/na/cp_g110402A.xml.html Return to text.